These glasses have so much diffraction you won’t believe it! 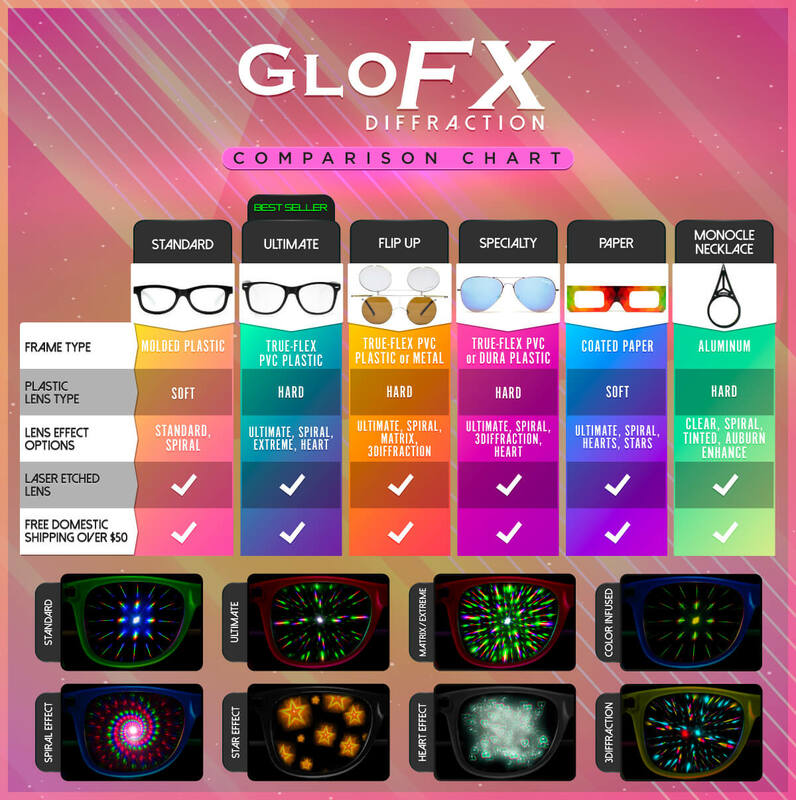 GloFX Ultimate Extreme Diffraction Glasses feature double stacked layers of premium light diffraction in a single frame design. Our Extreme Diffraction Glasses offer the same double layer effect as our Matrix series glasses, but consolidated into one lens. Put on a pair of Ultimate Extreme Diffraction Glasses and start blowing people’s mind while revolutionizing the way you see your world. These glasses are guaranteed to have the most diffraction ever! Our Ultimate Diffraction Glasses always feature a True-Flex PVC Frame, with stainless steel hinges and hard plastic lenses, so they are virtually indestructible! It took us months to conjure up this fantastic design! While many of our competitors use low-quality gradient film, we manufacture our glasses with a laser etcher, assuring long lasting and mind-blowing performance. Because the diffraction effect is built into the glasses themselves, there is no risk of weak spots. We pride ourselves on the guarantee that our Ultimate Extreme Glasses provide more diffraction and durability than any other frame on the market! Stop waiting and start impressing today, grab a pair of our maximum diffraction Ultimate Extreme Glasses, or two. Note: Due to the extreme diffraction effect of these glasses, ultimate extreme lenses may appear slightly blurry and have a slight curvature. Trippiest glasses ever! MIND BLOWN! At my last festival it started raining when I wore these glasses and they stopped working ? ? When I got home I called glofx and they told me that they don’t work that well when they get wet. They were so awesome though and helped me get another pair! These came so quickly and they are awesome! I’ve been to a lot of festivals this summer and these are so durable and have a tint so that people can’t really see your eyes. I like that it also came with two pairs of the paper glasses which are also nice, and great for when I don’t want to have to worry about losing my actual glasses. And the glow in the dark wristband was also an awesome addition too. GloFX knows what’s up!